"Something Rotten!" cast members in costume back stage. 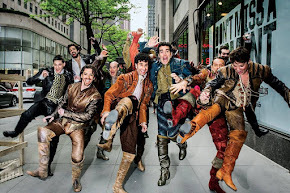 Photos from "Something Rotten!" Facebook page. IF the telling had been left to the History Channel, there would have been less tap and more truth in it. And a lot less musical theater! So, take a bow, “Something Rotten!. At the St. James Theatre through 3 Jan., the award-winning musical plants its genesis of the musical tale deep in the 16th century. Nick, in particular, is jealous of The Bard's idolized popularity. Nigel, however, is in awe of his colleague’s talent and seeks him out to critique some of his own work. Shakespeare thrives while the Bottoms … well … hit bottom. In desperation, Nick seeks out the soothsayer Nostradamus (Brad Oscar) to point him toward success. His goal is to create what the public wants. Meanwhile, Nostradamus sees "Cats!" in the future of the theater. Elsewhere, the Puritan Brother Jeremiah (Brooks Ashmankas) finds theater altogether repugnant and works hard to shut down all such entertainments, while his daughter, Portia (Kate Reinders), falls in love with Nigel. 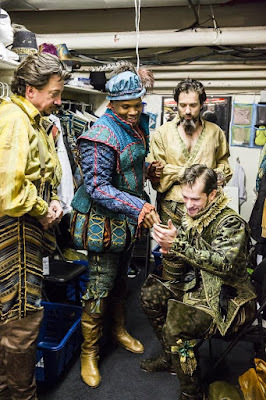 Rounding out the main players in the “Something Rotten!” cast are Peter Bartlett in the dual roles of Lord Clapham, patron of the arts and the Judge who ends up condemning them; Michael James Scott, a minstrel and part of the ensemble, and Gerry Vichi as Shylock, a money lender, as is well-known, but also a patron of the Bottoms. BO is a standout in a superbly talented cast, as is BdAJ. Under the direction of Casey Nicholaw the ensemble shines and sparkles like the stars. Speaking of which, everyone in the production is a longstanding Broadway star. 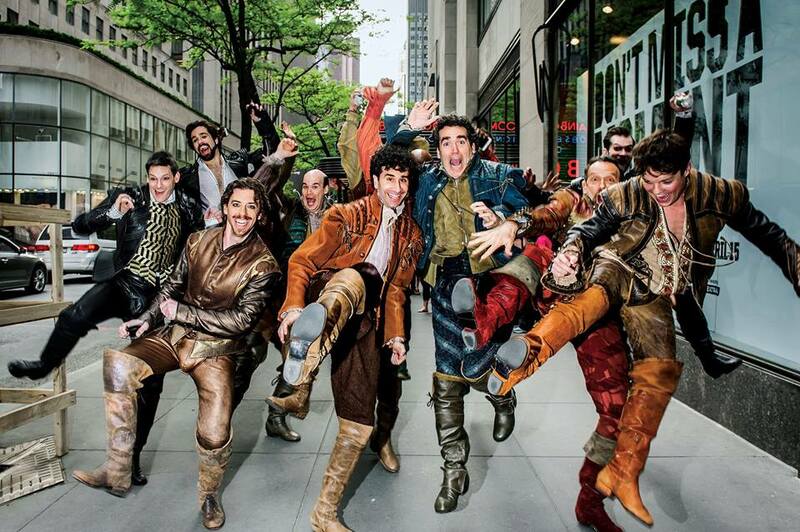 Rotten actors on the streets of New York City. “Something Rotten!” makes up its musical theater history from the bits and pieces of musicals we've seen and scraps of theater through the ages with all the assurance that make-believe can have. It's so not true, and oh-so plausible.